Described as a fusion fitness workout that is as satisfying for the mind as it is for the body, Nia classes will promote your well being and health on every level – body and mind. It is a workout that is guaranteed to put a smile on your face and leave you happy and feeling good long after class is finished. Nia is perfect for any age or fitness level, both male and female, and no experience beyond the desire to move your body is required. It is designed for any body and is ageless and limitless, transformational and effective for every person everywhere – from athletes, dancers and fitness instructors, to children, special needs groups and the elderly. 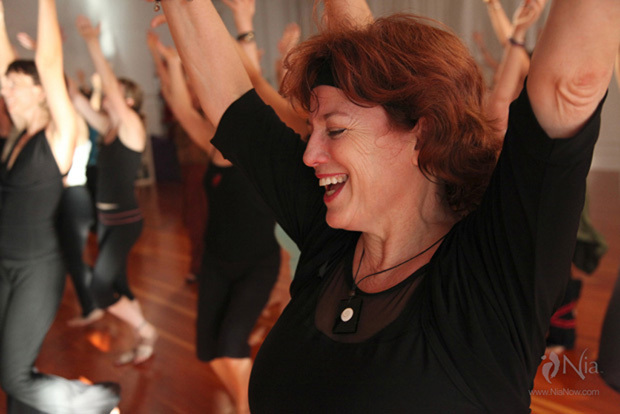 Classes use a wide variety of music mindfully selected to inspire a range of physical, emotional and mental responses, offering both form and freedom. The movements are simple and repetitive on purpose – by repeating movements over and over the body relaxes and has a chance to pay attention to details such as position of the feet, hands, or head in a movement sequence. No movement experience is required. Nia works in an East meets West approach, incorporating the dynamics of stillness, posture, dance, gesture, sound and silence. 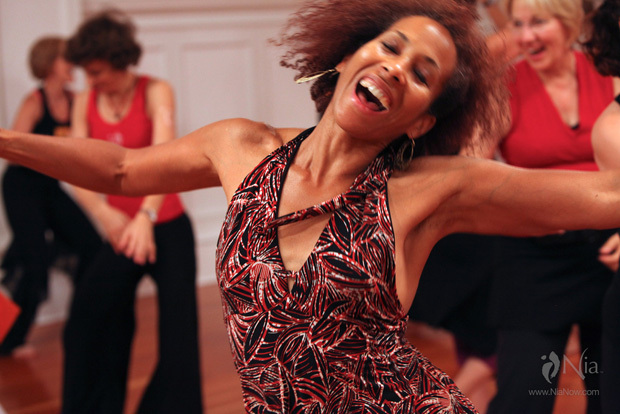 Free dance encourages intuitive and spontaneous movement allowing you to move in your own unique way, exploring both outer and inner space. Focusing on how the body feels, rather than how it looks, creates a movement style that is freer than any other dance-based exercise. Nia is taught at three intensity levels and three planes of movement – encouraging you to work at the level that feels good for you. Based on the Pleasure principle, Nia encourages conditioning the body from a place of feeling good and enjoyment…not pain or discomfort. How does the Nia experience differ from other “mind-body” programs? Everything in Nia is perceived, experienced and processed through the body. Body to develop Sensory IQ wisdom. Emotions to personally engage the individual with activity, thereby creating the coupling effect needed to trigger the mind-body connection. Spirit is used to honor the uniqueness of each individual. Nia uses emotion and sound to condition the body and nervous system. Nia’s teaching style emphasises internally directed guidance, uses visual and sensory language, user-friendly choreography, that can be adapted to fit personal needs, and includes three stages of learning for all levels of ability.